I thought it was time for a post on one of my go-to recipes. Bread is a staple food in the western diet. But for people with allergies and intolerances, bread is often one of the trigger foods for an upset tummy and unhappy skin. Gluten and yeast are a big no-no for the kids and myself, causing bad gut pain and triggering eczema. Most gluten-free breads are yeasted, as well as a tad on the pricey side. I have seen a few gluten-free sourdough breads pop up in the shops recently, but at $8-$11 bucks per loaf, our tiny budget can’t afford it. Especially when I can make a delicious loaf for a fraction of the cost at home. And there are no additives, such as xanthan gum and other thickeners, which can sometimes aggravate the gut. Another reason I prefer a sourdough bread is because of the traditional process used. Fermenting the grains helps to breakdown the enzymes and starches in the flours in a way that our bodies are used to. This process not only creates a beautiful flavour, but unlocks the proteins and nutrients making a far more nutritious bread that is easier to digest and absorb. And the texture is wonderful, without the use of yeast! So for those of us with an imbalance of candida (yeast) in our bodies, this is a good thing. 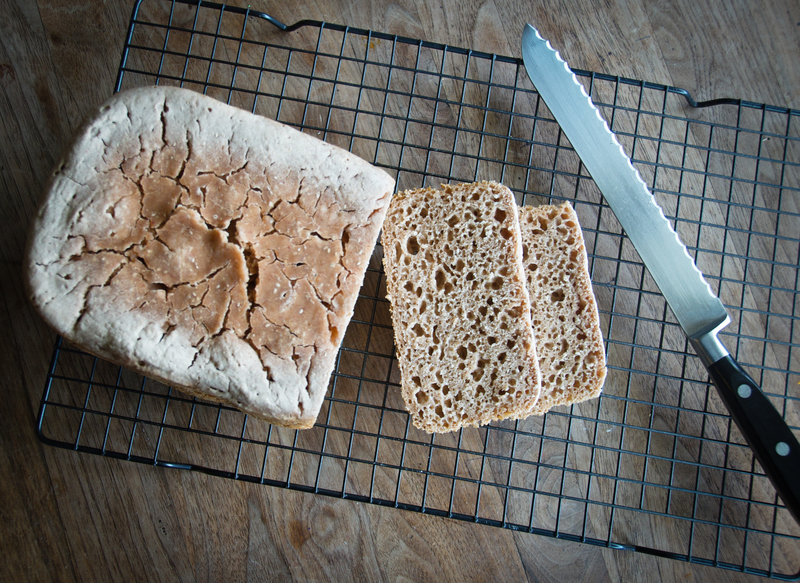 I adapted this recipe from the No-Knead Gluten-Free Sourdough by Homegrown Kitchen (one of my favourite food blogs that you should definitely check out, if you haven’t already). Instead of using buckwheat, I use red sorghum flour. I prefer the taste and it also helps to make a really lovely and vibrant sourdough starter. You could also use white sorghum flour too, but I can get the red sorghum flour more easily in New Zealand. I also make the bread with a homemade flour blend that uses red sorghum, brown rice, tapioca starch and potato starch. But otherwise, my method is identical to Nicola’s method on Homegrown Kitchen. She also provides great instructions on how to start and maintain your own gluten-free sourdough starter. And the video is super helpful too. For those in NZ who have difficulty finding some of these flours, iHerb.com is a website that ships internationally at an inexpensive rate, and it only takes around 4 days for the items to arrive via courier. I purchase quite a few of my gluten-free flours and speciality foods from there when I can’t find them in New Zealand. Otherwise I use Moore Wilson’s and Davis Trading for some of the other specialty flours and foods. I find these three suppliers have the best prices by far, and when on a budget, this is really important. 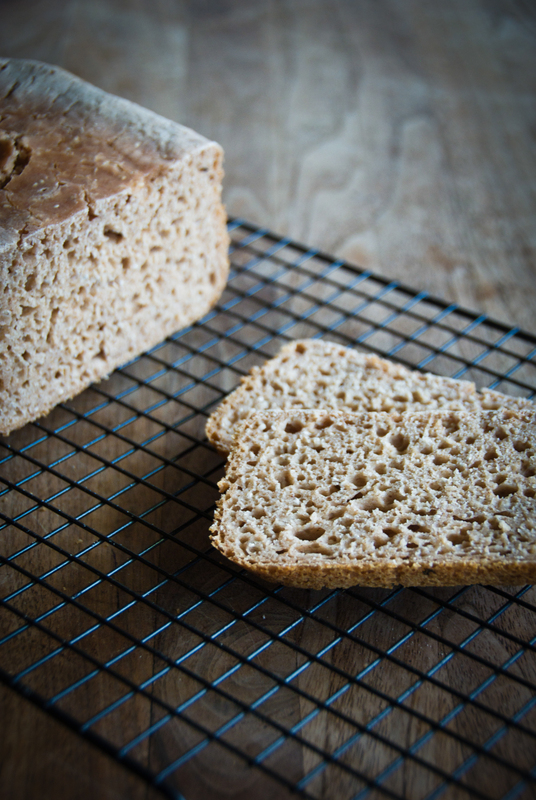 I have included links down below (and all over this post) for Nicola’s simple instructions on getting your gluten-free starter going. Instead of using brown rice flour on its own, I use equal parts of red sorghum (or white sorghum or teff) and brown rice flour. I find it makes a richer tasting sourdough starter with better structure. Preheat oven to 190 Celsius unless using a bread maker on bake only setting. Place the dry ingredients in a large mixing bowl and whisk to combine. Make a well in the centre of the dry mixture and pour in the starter, olive oil and 250 mls of filtered water. Using a wooden spoon or rubber spatula mix to combine (avoid using metal as it can react with the acid in the starter). Add more water 1 TBLS at a time until the consistency is like a thick cake batter (see Nicola’s awesome video for the consistency). Beat the mixture vigorously by hand for a minute or so to incorporate air into it. If baking in the oven, place the loaf tin on a rack in the centre of your oven and bake for about 60-70 minutes, or until the loaf sounds hollow when tapped on the bottom. If baking in the bread maker, turn it on to the ‘bake only’ setting and bake for 60 minutes. *Potato starch is usually called potato flour in NZ. It is completely white and very starchy. Bob’s Red Mill also makes a genuine potato flour, which is yellow and consists of dehydrated whole ground potatoes, and is another thing altogether. So make sure you are buying in fact getting potato starch, even if it is labelled as either in NZ. Genuine potato flour (the yellow stuff) cannot be used in place of potato starch (the white stuff) as they are two VERY different things (although there is much confusion around it). **A mature and healthy starter is sour and bubbly. If you are starting your GF starter from scratch, I would recommend to continue feeding it well for at least 4-5 days after it has become active in order to get better results. The patience pays off. A hungry starter is one that is ready to be fed again. You can find simple and informative instructions on getting a gluten-free starter going from this Homegrown Kitchen post. *** I live in a cold, damp, drafty flat in Wellington (yay), and bread hates my house. There is no warmish spot for bread to rise. I sometimes use my slow cooker for rising bread in because it creates a more constant environment that is free from drafts (bread and my slow cooker are best friends). If I start the bread at night I will leave it to rise overnight in my cool slow cooker with the lid on and then bake it in the morning. A damp cloth on the bottom of the slow cooker helps create good humidity for a quicker rise too. When it is cold in my home, I will either place a warm/hot water bottle in the slow cooker, or turn the slow cooker on high for 5-10 mins and then turn it off before placing the bread in it to rise. But this will cause the bread to rise more quickly so I often only do this in the day so that the bread doesn’t rise and then fall before I can bake it. I recently acquired a bread machine, so now I make the batter before I go to bed and leave it in the bread machine (switched off) overnight and bake it first thing in the morning once it has risen well.